Although I dearly loved the 1986 remake of The Fly, it took years before I could bring myself to watch the 1958 original. What I knew of the film made it look impossibly cheesy, what with some dude running around wearing a silly fly head, and that ridiculous, high-pitched "help me!" When Fly hit on DVD, though, I decided to finally take a look at this movie. To my surprise, I actually found it to offer a pretty effective rendition of the tale. Fly works pretty well. When he thinks he has the machines working correctly, André impulsively hops in the gadget himself. Whoops - missed that fly that zipped in with you, dude! As a result, when both critters pop out of the device, some body parts have switched places; the little fly's buzzing around with a human head, and vice versa. Most of the plot comes in flashback, as the movie starts with Andre's apparent murder. His wife Helene (Patricia Owens) seems to be the culprit, and she also appears to have gone off the deep end as she relates this information to police Inspector Charas (Herbert Marshall) and her brother-in-law Francois (Vincent Price). After she proves elusive for a while, Helene offers all of the nasty details and we eventually discover Andre's ultimate fate. As with the 1986 version, it ain't happy; both movies are essentially tragedies at their hearts, though the remake is much more powerful since the original puts too much of a “feel good” spin on the sad events. Nonetheless, it's a surprisingly somber piece for the era, and it rarely descends to the level of campiness I expected. As silly as it can be - mainly due to the weak effects - it still seems pretty creepy. I was even spooked by those eerie cries of "help me!" Actually, I don't know what I would think of this film were I not so well-acquainted with the remake. I feel as though I may have filled in some of the gaps. Perhaps the tragic aura wasn't really there but I interpreted it that way due to my familiarity with the 1986 movie. While the original never lets its lead character fall to the depths seen in the remake, we do see hints of the depravity to come. In the 1986 film, much is made over the vicious character our man-fly will become when the transformation is complete, and he has to fight off his more brutal instincts. Those points aren't emphasized to the same degree in the original, but they're there and it's clear they're a factor in the decisions that are made. Again, I never felt as involved in this one as I was in the remake, but the 1958 edition of The Fly still managed some effectively eerie material. 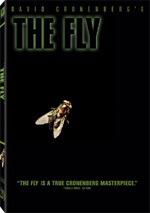 The Fly appears in its original theatrical aspect ratio of approximately 2.35:1 on this Blu-ray Disc. This was a decent but somewhat erratic image. Sharpness displayed the most significant distractions. A mix of shots came across as a bit soft, especially in wider elements. Much of the movie showed fairly good definition, but too much of it tended to seem less than concise. No issues with jagged edges or shimmering occurred, but I saw some edge haloes at times. Grain seemed natural, and the image lacked print flaws. Colors were also erratic but generally good. The movie didn’t boast a particularly dynamic palette, and it occasionally tended toward the slightly bland side of the street. However, the tones mustered nice reproduction most of the time, and the smattering of brighter hues looked nice. Black levels could come across as a little flat and murky, but for the most part they appeared deep and nicely dark, with solid tones that didn't look too heavy. Shadow detail was similarly fine, as the low-light situations displayed appropriate levels of nuance without excessive thickness. Ultimately, The Fly remained completely watchable, but the different concerns knocked it down to a “B-“. As for the DTS-HD MA 4.0 soundtrack, it provided a relatively active sonic environment. Lots of audio came from the side channels and the rears contributed some useful atmosphere at appropriate times. The mix worked well when we heard music or effects. These filled the space nicely with elements that created a nice sense of environment. However, dialogue lacked consistent localization. Most of the lines seemed accurately placed, but some of them blended with the wrong speakers, and this could become a minor distraction. Audio quality was dated but decent. Speech tended to be slightly stiff. However, the lines seemed concise and lacked edginess or other problems. Music came across as a bit metallic as well, and range wasn’t great. Nonetheless, the score was acceptably bold for its age and seemed well-reproduced. Effects fell into the same realm, as they showed their age but remained clear and fairly accurate. For the most part, I liked this track. It wasn’t perfect, but it was definitely above average for a film from 1958. How did the Blu-ray compare to the 2007 Collector’s Edition DVD? Audio appeared a bit more robust, and visuals showed improved cleanliness and accuracy. While the disc didn’t dazzle, it did represent the strongest incarnation of the film on home video to date. When we shift to extras, we start with an audio commentary from actor David “Al” Hedison and film historian David Del Valle. Both sit together for this running, screen-specific discussion. They chat about the original story on which the film is based, cast and crew, and general memories from the set. This track starts out in a pretty lively manner as we learn some nice notes about the movie. We get nuggets about the director, other cast members, and elements of the shoot. However, the commentary slows down before too long and never really picks up steam again. The content becomes less than stellar, and more dead spots occur. These seem especially problematic because Hedison whistles loudly through his nose when he breathes, and that sound gets annoying quickly. Del Valle’s presence creates a disappointment. I expect film historians to provide strong background information, but Del Valle mostly just seems like a gossip as he yaks about Vincent Price and others. He does help motivate remarks from Hedison, so at least he functions as a moderator. Overall, this track has enough to it to merit a listen, but don’t expect a lot of fascinating details. Vincent Price: The Versatile Villain runs 44 minutes, three seconds and gives us remarks from biographer Lucy Chase Williams, daughter Victoria Price, director Roger Corman, and actors Norman Lloyd, Hazel Court, Roddy McDowall, Jane Russell and Dennis Hopper. The program covers Price’s early life and interests in art and travel as well as acting, his progression in his chosen career and his personal life, successes on the screen and his lifelong pursuit of fine art, and the development of various areas. Unlike most A&E “Biography” episodes like this, “Villain” comes with virtually no scandal or dirt. Apparently, Price’s two divorces were as scandalous as things got, and neither offered any intrigue. This comes as a relief, as it’s nice to see a big star with a relentlessly normal life. Granted, it does make “Villain” a little dull at times; I hate to admit it, but a star’s mental illness is a lot more interesting than his art collection. Still, this offers a nice take on Price’s life and career, and it’s fun to see clips from his commercials and other non-film efforts. Next comes a featurette called Fly Trap: Catching a Classic. It runs 11 minutes, 30 seconds and includes comments from Hedison, Del Valle, screenwriter/film historian Steve Haberman, director/writer Donald F. Glut, Fangoria Magazine editor Tony Timpone, and actor Brett Halsey. We learn about the source story and its path to the screen, cast and performances, the film’s success and sequels. “Classic” seems too brief and too general. It needs a lot more time to adequately cover all three movies, so while we get some decent notes, the piece doesn’t tell us much. A Fox Movietone News reel lasts 54 seconds and shows the San Francisco premiere of The Fly. A mix of movie monsters show up to promote the flick and we watch. It’s an odd tactic but fun to see. Finally, we get the film’s Theatrical Trailer. The one-minute, 59-second promo proves more interesting than most, as it includes some exclusive elements like narration from Vincent Price. 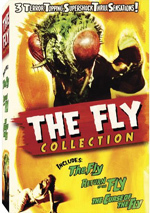 While it doesn’t compare favorably with its 1986 remake, the original 1958 Fly has creepy charms of its own. Yeah, it becomes cheesy at times, but it provides a reasonably effective little horror tale. The Blu-ray delivers erratic but mostly good picture and audio along with a few decent supplements. I can’t say the Blu-ray impresses me, but it brings us a fairly positive representation of the movie.